It’s not just Sonam, Priyanka or Deepika, there’s a new international fashionista in town. Recently, Elle India magazine featured Longchap, an international fashion brand, and Vaani Kapoor dazzles everyone with her impeccable taste. This fashionista knows what’s hot and what’s not. Without any further adieu, let’s take a closer look at what she wore at the launch! Happy reading. 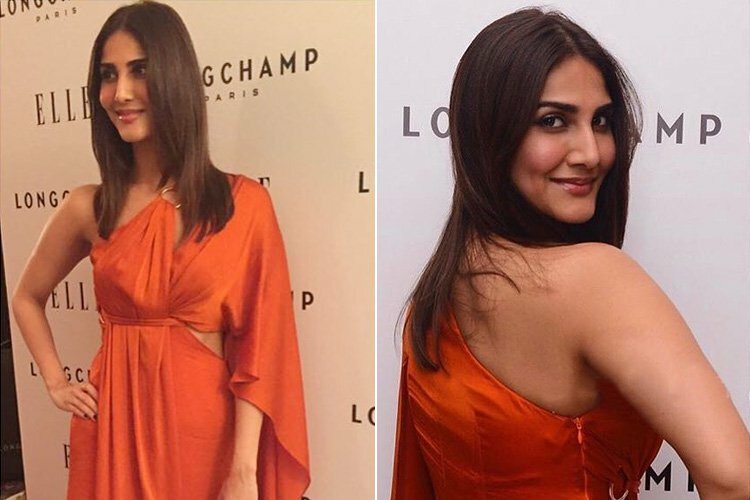 For the launch, Vaani Kapoor selected an outfit from Lola by Suman B. The solid orange color gown with a halter neck. It was an excellent option to wear at the carpet. The satin fabric over her shoulders, like a cape, which is the latest fad in the fashion world. The fashionista carried her outfit with confidence with style and elegance. As for her hair and makeup, she stuck to the minimalist look. Her hair looked perfect over her shoulders with a traditional middle parting, nothing radical. The natural makeup accentuated her good looks. Special thanks go to Sujala Newar, stylist, worked put together this fabulous look that we can’t have enough off. That’s not all, to go fabulosly with her dress she selected a pair of silver shoes. And if you were wondering if this fashionista wore any jewelry, well yes she did. She selected a ring. We loved her look, did you? Share your thoughts with us in the comments section. If you liked this article, spread the love by sharing it with your friends. Don’t forget to subscribe to our website for the latest style updates. Stay stylish!